Museum Founder Bill Miller at a press conference announcing the museum. The House of Cash is finally coming home to Music City. At a press conference in Nashville today, it was announced that a new Johnny Cash Museum will open downtown, just steps from Broadway and the Country Music Hall of Fame. The museum, slated to open this summer, will eventually feature 18,000 square feet filled with letters, song manuscripts, costumes, and instruments from Cash’s career, along with exhibits centered on his home life. 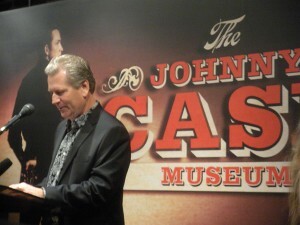 Bill Miller, museum founder and long-time friend of the Cash family, said his hope for the project is that it will be more than a collection of artifacts, but an experience to keep Johnny Cash’s spirit alive in the world. The new museum will also feature innovative digital displays that are being designed by Nashville based Griffin Technologies. As the museum expands, it will also include a performance space, onsite food venue, and a functional archive. John Carter Cash may have said it best, noting that many of the items to be featured in the museum have gathered dust in many different ways over the years, and deserve to see the light of day again to continue Johnny Cash’s legacy. For more information on the museum, visit www.johnnycash.com.